In this groundbreaking book, bestselling author Theresa Cheung joins forces with cognitive neuroscientist Julia Mossbridge, PhD, Director of the Innovation Lab at The Institute of Noetic Sciences (IONS). Together they reveal revolutionary new research showing that sensing the future is possible, they also provide practical tools and techniques you can use to develop your own powers of precognition. Theresa Cheung has a Masters from King’s College Cambridge and has spent the last twenty years writing bestselling books and encyclopaedias about the psychic world. Two of her paranormal titles reached The Sunday Times top ten and her international bestseller, The Dream Dictionary, regularly bounces to number 1 on the Amazon dreams bestsellers chart. Julia Mossbridge MA, PhD is a cognitive neuroscientist and director of the Innovation Lab at the Institute of Noetic Sciences (IONS) and visiting scholar in psychology at Northwestern University. She is the author of Transcendent Mind one of the first academic books to examine paranormal experiences, published by the American Psychological Association in 2016. Her research focus at IONS is precognition and the possibility of time travel. "Dr Julia Mossbridge and co-author Theresa Cheung show us that our everyday notions of time do not reflect the scientific reality of how time can work in our lives. They dare to examine the so-called anomaly of precognition in a clear-headed way, hopeful that as a society we can build teams of "Positive Precogs" who globally move us toward positive events and away from negative ones. This book is a major contribution in our understanding of reality and the dormant potential for the so-called supernormal that exists within all of us. Read it and discover the power of time within your mind." "It seems that the ‘other side’ might be in ‘another time.’ In this book we have a mystic and a hard-core scientist using fascinating and accessible examples to demonstrate the remarkable possibilities of precognition and how to access it in your own life." While reading the Premonition Code I felt how my mind set steadily transformed. This easily accessible book on the human capacity to foresee future events presents personal accounts as well as recent scientific insight. What is more, it is about a practical mind technique, probed and tested over the last decades, which might enable us to better sense the future. This book could become the I Ching of our times. "Dr. Julia Mossbridge and Theresa Cheung, in Premonition Code, have written an excellent and compelling book that will present the reader with the very latest research in nonlocal consciousness, as well as a way to use these findings to improve their own lives. I recommend it." 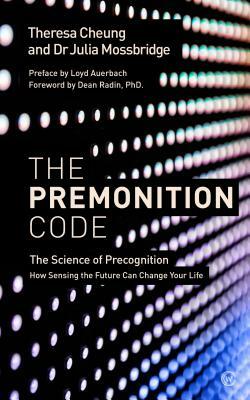 "I am excited about The Premonition Code because it exhibits a long overdue blending of the scientific and the spiritual fields in the examination of precognition. Where so many have looked at these disciplines as enemies, Dr. Julia Mossbridge and Theresa Chung realize that they compliment each other beautifully. Attention all truth seekers, whether you're a skeptic or believer, you are in for an amazing journey. Read this important work and unlock The Premonition Code." —Jim Harold, Author and Host of The Paranormal Podcast, 31 million downloads and counting!